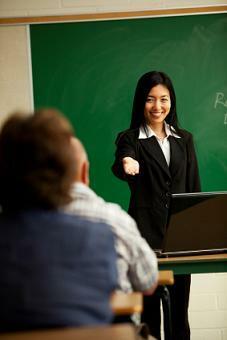 Do you want to know the answer to "Can I teach college classes with an MBA degree?" An MBA is a Master of Science in Business Administration. This graduate-level degree is one educational tier above a bachelor's degree and one below a PhD (Doctor of Philosophy) or PsyD (Doctor of Psychology). An MBA prepares graduates with a blend of business theory and advanced skills. A degree program offered by many universities and business schools, an MBA provides students with the advanced skills necessary to work successfully within corporate structures and cultures. While the standard MBA is considered primarily a business degree, the focus of your MBA studies can include areas such as finance, ethics, marketing and more. According to the Bureau of Labor Statistics, most universities and four-year colleges hire tenure-track teachers with a PhD or higher. However, a master's degree (including an MBA) may qualify candidates to teach in certain disciplines including the arts, or as part-time instructors and temporary hires (such as teaching specific classes). An MBA graduate who is on track for a PhD may also be hired as an instructor for online colleges and classes within the instructor's specific discipline. At the community college level, most of the full-time instructors hold a master's degree. In many cases, an MBA is not the only criteria for teaching at any level; graduates should also have certification from the state in which they wish to teach as well as standard teaching experience and familiarity with distance learning. At smaller schools, an instructor with dual master's degrees (such as an MBA and a Master of Arts in English) may be a more preferable candidate because they can teach more classes. In education, it is a standard rule of thumb for the instructor to have at least one degree higher than what they are teaching. For example, to teach at the elementary, middle and high school levels, a teacher must have at least a bachelor's degree as well as their teacher's certification. The bachelor's degree is one degree beyond a high school diploma and associate's degree.At the community college level, a master's degree is one degree beyond the associate's degree the student will acquire during their studies. At the bachelor's degree level, most instructors must hold at least a master's degree, though a doctoral or work at achieving a doctoral degree is desired. At the doctoral level, instructors must hold a doctoral degree or dual doctorates. Most MBAs require three to five years of real work experience prior to admission into the master's program. If you have sought an MBA or are close to completing your MBA and are interested in answering the question, "Can I teach college classes with an MBA degree?" contact your local community colleges for their requirements to teach business classes on or offline. In most cases, you will need at least a one-year program in teaching to receive your state certified credentials to stay in line with the college's accreditation. College business instructors with an MBA and practical experience can provide their students with a supportive and informative experience to better prepare them for the corporate climate.